“after all the terrible things I do” – Video Trailer from Milwaukee Repertory Theater on Vimeo. Tonight after all the terrible things I do will be playing its final performances at The Milwaukee Repertory Theatre. To say that working in the Midwest with this team at this theatre was a delight would be the understatement of the year. I’m so very proud of the work we’ve done, grateful for the support we had in doing it, and humbled by the response of the Milwaukee critics and audience. Thank you, thank you, thank you. There are two more chances to see the play today at 2:00 and 7:00 pm (and there are still some good seats available for the 7:00 pm, because we’re competing against a Packers game — have you ever heard of such a thing, my NYC friends?). Please join me at either or both performance before this gorgeous production becomes the stuff of sweetest memory. Sophia Skiles as Linda and Mark Junek as Daniel. Photo by Michael Brosilow. 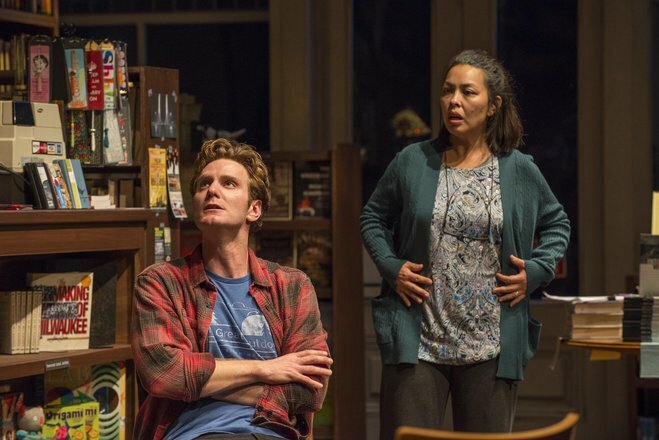 Two more glowing reviews of The Milwaukee Repertory Theater’s production of after all the terrible things I do have hit the Internet since that last opening week. Once again, I cannot believe this reception. Thank you, thank you, thank you, Milwaukee. I hope this is just the beginning of a long lasting friendship. In terms of my site, I’ve added a terrible things Press page with pull quotes and links. I’ve also added a gallery of the promo materials, since I loved that marketing campaign so very much. And, finally, one little announcement: I will be in Milwaukee for the closing weekend of the show, 11/6 – 9, 2014! I’ll be part of the talkback the evening of the 6th and at every evening performance of the show. Please come join me! I’m so very proud of what The Rep and the performers have done with the play, and I can’t wait to see this production out in style. For full show information click here. To tweet, post, or tell us your own terrible things click here. Single Tickets for all of Milwaukee Repertory Theater’s 2014/15 productions are now on sale and can be purchased through The Rep’s Ticket Office by calling (414) 224-9490, online 24/7 at www.MilwaukeeRep.com, or in person at 108 E. Wells Street. Group tickets are also available for purchase by calling Group Sales Manager Joy Surber at (414) 290-5340. Mark Junek as Daniel and Sophia Skiles as Linda. Photo by Michael Brosilow. I am so grateful for the warm reception, especially since I’m a Midwestern boy at heart. To share my work and speak to this community makes me happier than you can imagine, and I hope it’s just the beginning. In addition, the Gallery for Michael Brosilow’s photos of The Rep’s production can now be found here (including that beauty up above). Once I figure out appropriate pull quotes, I’ll add a press page for the play. Mark Junek as Daniel and Sophia Skiles as Linda. Photo by Micahel Brosilow. The Milwaukee Rep‘s production of after all the terrible things I do opened last Friday, and it’s a hit! Below are the two reviews that have posted so far. Also, as promised, here’s a link to the episode of WUWM’s Lake Effect (Milwaukee’s local NPR affiliate) in which May and I are interviewed about the play from 32:28 through 42:11. I also appeared on WCPT’s Out! Chicago program yesterday (Sunday), but those episodes aren’t posted online. I’ll see if I can get my hands on a clip of that for you. Thanks again to everyone that has advocated, supported, and devoted themselves to this play. I am thrilled at my first Midwest premiere, gladdened by the favorable response, and am hopeful that this won’t be my last of either! 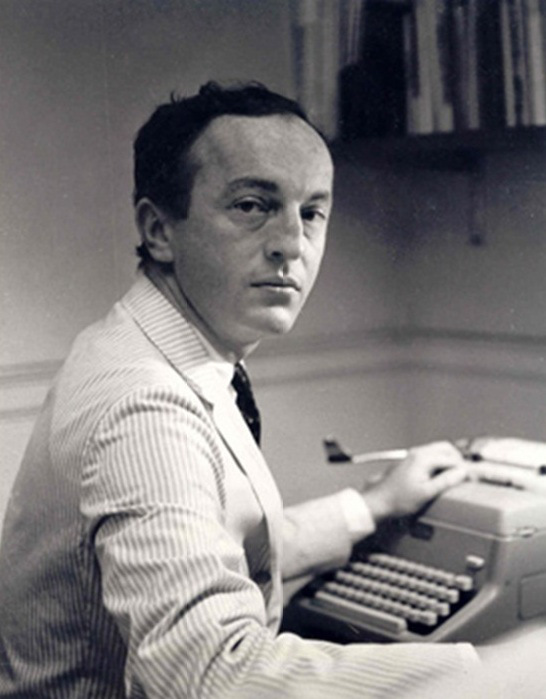 Our second preview of after all the terrible things I do is tonight and in anticipation of our imminent opening on Friday, I would like to share a few poems by Frank O’Hara. I first read O’Hara’s Lunch Poems when a graduate school teacher gave me a copy. I enjoyed many of the poems, but for some reason my obsession didn’t quite kick in. A year or two later, though, I read O’Hara’s poem “Having a Coke With You” and the deal was sealed. 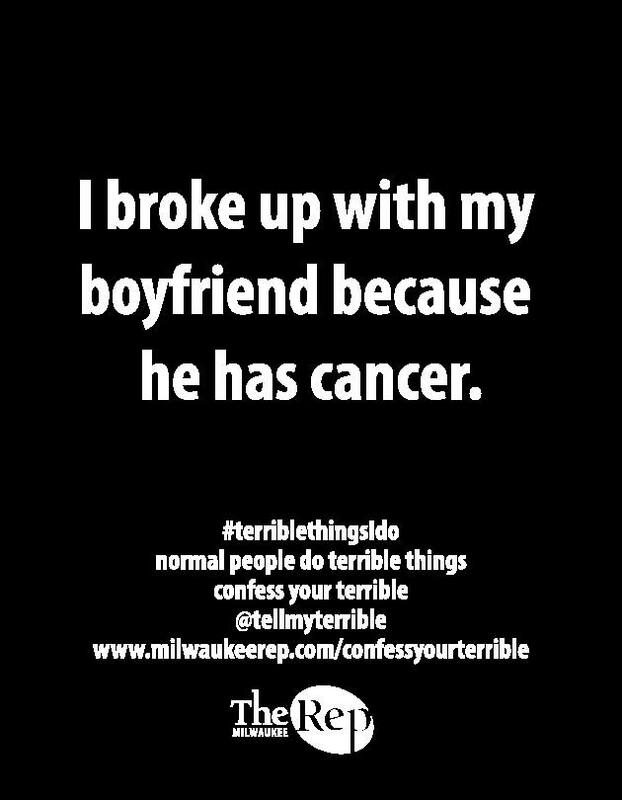 Click here to buy tickets to after all the terrible things I do, now playing at The Milwaukee Rep. 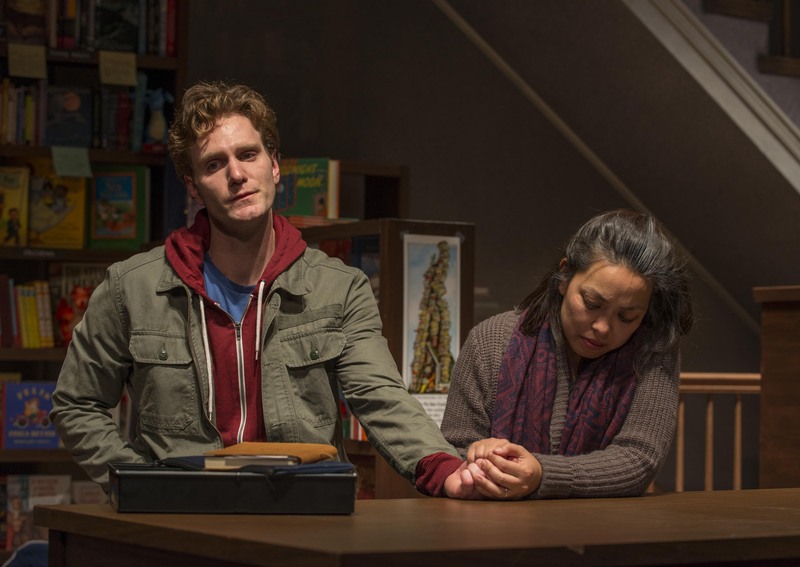 In anticipation of our first preview of after all the terrible things I do at 7:30pm this evening and our opening on Friday, The Milwaukee Journal Sentinel published a preview article touching on the themes and inspirations for the play. 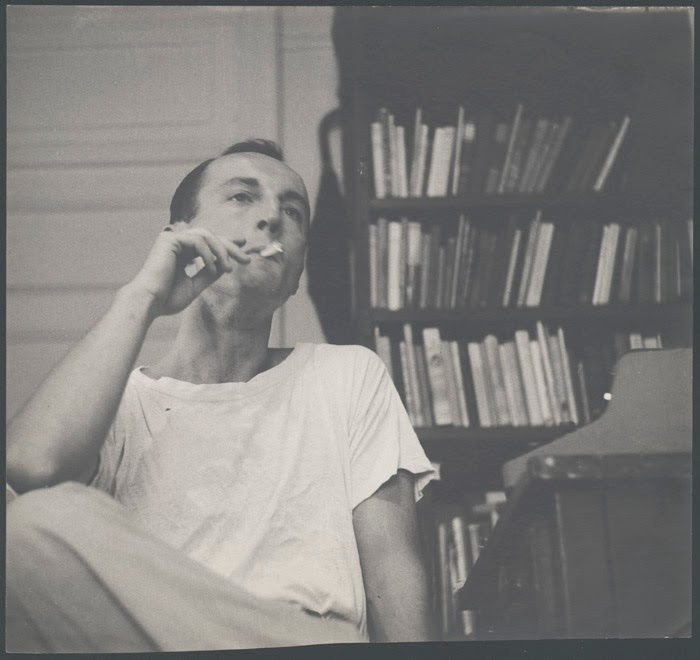 Personally, I’m loving the Frank O’Hara shout outs! Another preview appeared in OnMilwaukee where my amazing (amazingamazingamazing) cast spoke with their Matt Mueller. I’m so touched by their compliments and am glad that the show has been so fun for them! We had a small invited dress rehearsal last night, and are excited for our first actual audience. There are still a few seats left — it being a preview and all — but, if I can be just a little bit braggy, we’re ready for people to come see the show. I’m not saying there won’t be any adjustments in the next couple of days, but they’re definitely the sorts of adjustments that come from watching people watch the show. So come buy tickets and come by the theatre tonight, and you’ll be doing us a favor. Tech for after all the terrible things I do has been proceeding apace, and it has been amazing to see the show coming together. I am utterly amazed by the work of my collaborators: Daniel Zimmerman on sets, Keith Parham on lights, Andre Pleuss on sound, and Mary Folino on costumes with our awesome stage manager Richelle Carlin Harrington keeping us all on task. I have little doubt that we will be ready to show this play to the world when previews and opening come around the corner! To that end… come on over to The Milwaukee Rep, world, and see the show! To get the word out we’ve come up with some new images for the play and encourage you to tweet, post status updates, and hashtag the terrible things that you do. As mentioned in my playwright’s note, when I started the play I was trying to understand bullies. Part of that understanding was wondering whether there were any deeds so horrible that there would be no second chance or redemption for their perpetrators. 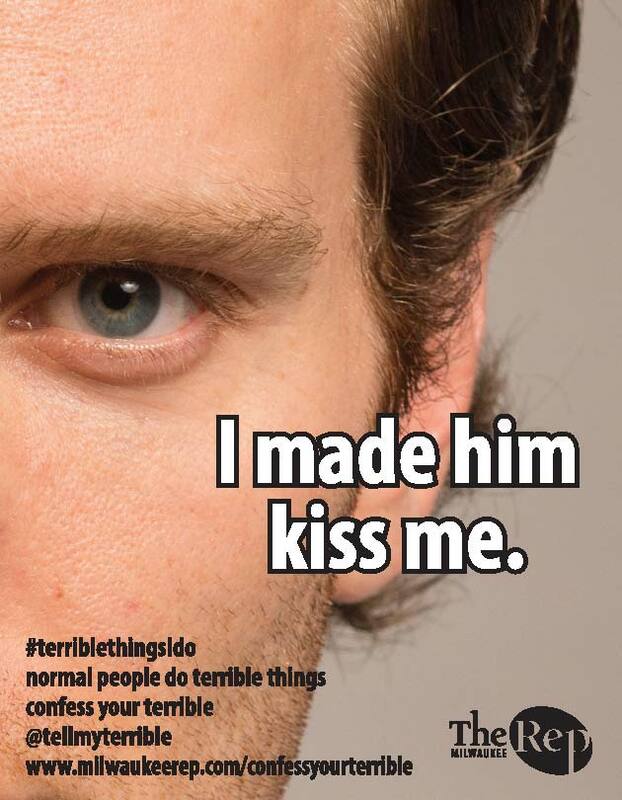 Everyone has done a terrible thing or two — what are the terrible things you’ve done? Do you regret it? Have you sought forgiveness or redemption? Did you get it? Tweet us @tellmyterrible, post to your favorite social media platform using #terriblethingsIdo, or click on http://www.milwuakeerep.com/confessyourterrible and tell us about it. I’ve also done a couple of interviews to get the word out about the play, including a lovely (but a little odd) conversation with Dominique Paul Noth at Urban Dial. Sure my name is in quotations as though it were fake (it’s not even a diminutive — Rey is the whole thing, top to tail), it sounds like I went to Yale undergrad (I didn’t), and um… those quotes? They’re approximations of things I said. But I guess I’ve learned from the press thing to just be happy when journalists actually express the ideas I was expressing (he mostly is). I do want to point out, though, that at no time did I say The Milwaukee Rep was treating me royally. They have been awesome — don’t get me wrong — but if anyone started treating me like royalty I would start buying them cookies or finding ways to boost their self-esteem. I am allergic to privilege and entitlement and those words… I never said those words. And, finally, here’s a little announcement in Shepherd Express. Nothing new here, but it contains a quote that I actually said! How novel. Given the many sensitive topics in after all the terrible things I do, we decided a few months ago that a program note for the upcoming production would be a good idea to prepare people for what they’re about to see. 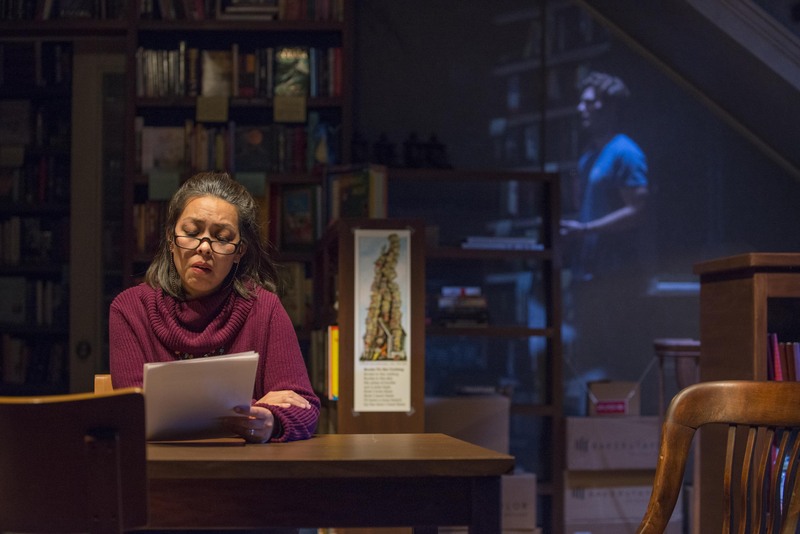 I’d never done one before and usually prefer that my plays speak for themselves, but as I am myself disturbed by some of the things encountered in this story, I agreed. We start tech today, and as we jump into the part of the rehearsal process that’s a bit headier, I thought I would share the note with you to keep the heart of the play in mind. It was with bittersweet relief that I recently read two parenting articles on empathy by The Washington Post’s Amy Joyce this spring, three years after I began writing after all the terrible things I do. Encountering “Teaching Empathy” and “Are You Raising Nice Kids?” was sweet because it offered advice we need for raising children who are considerate of others and bitter because we actually need this advice. We have prioritized being the best, most competitive, and happiest over being the humblest, most generous, and most understanding. We’ve done it to the degree that division, acrimony, and even violence have become the standard in our politics, our jobs, and our schoolyards. The breadth of human experience is so diverse that understanding (let alone relating to) everyone’s unique, bizarre, or horrifying actions seems impossible. after all the terrible things I do started as a study of bullies, repugnant creatures who victimized others to establish control and dominance — people I felt I would never understand. It became an exercise in offering them the very thing they were unable to offer their victims: empathy. Could I (and eventually the audience) recognize bullies as fellows, step into their shoes, and understand how their strengths and fears led them to act in ways I could not? Or are their actions so terrible that empathy for them is beyond my grasp? I would like to thank The Milwaukee Rep, my frequent collaborator May Adrales, and you for wrestling these ideas with me. Maybe the magic of theater can make those Washington Post articles less necessary as the skills for building community become lessons we live rather than lessons we must be reminded to teach. Even more, perhaps with stronger communities built on mutual understanding, bullying will seem less and less necessary or useful for us all. 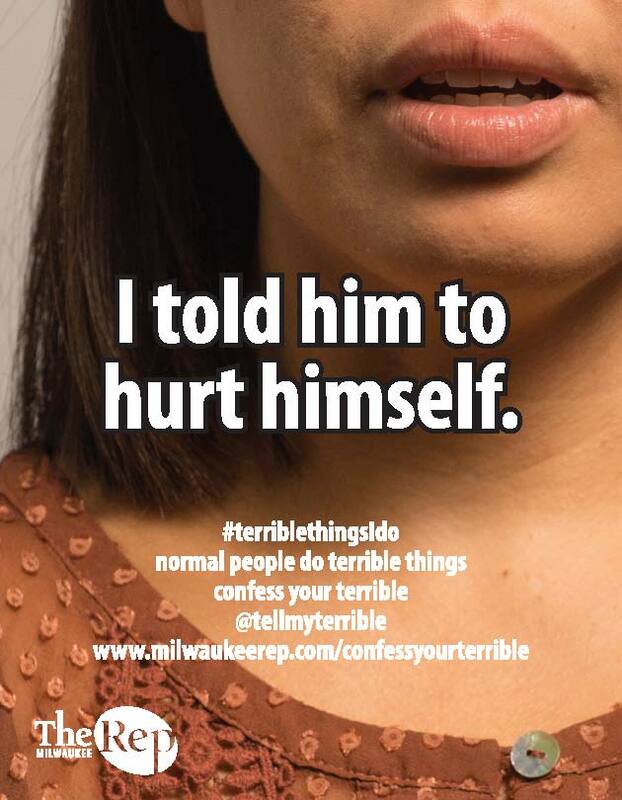 Tickets for after all the terrible things I do are available at The Milwaukee Rep website or by calling (414) 224-9490. Tell all your friends in the Milwaukee area. If you’re in Chicago, take the hour or so to drive north. I guarantee it will be worth your while. By the end of this week, the team behind the world premiere of after all the terrible things I do will be heading into tech at The Milwaukee Repertory Theatre. And what a team it is! I am endlessly surprised, delighted, and terrified by these collaborators — their work is that inspired. As we get closer to opening, I’ll have more to post, but for now I’ll just tease you with these show announcements. Super Exciting Double-Posting/Announcement Day, Part 2!!! I sort of can’t believe it, but it’s on the Internet, so it must be real. Wait a minute… okay, so forget that first part and instead let’s say it’s real because I signed stuff. Like paper stuff. Now it’s real. My play after all the terrible things I do will have it’s world premiere production at Milwaukee Repertory Theatre this fall. May Adrales, will be directing, reuniting us for our first major show since Edith Can Shoot Things and Hit Them at Actors Theatre of Louisville. 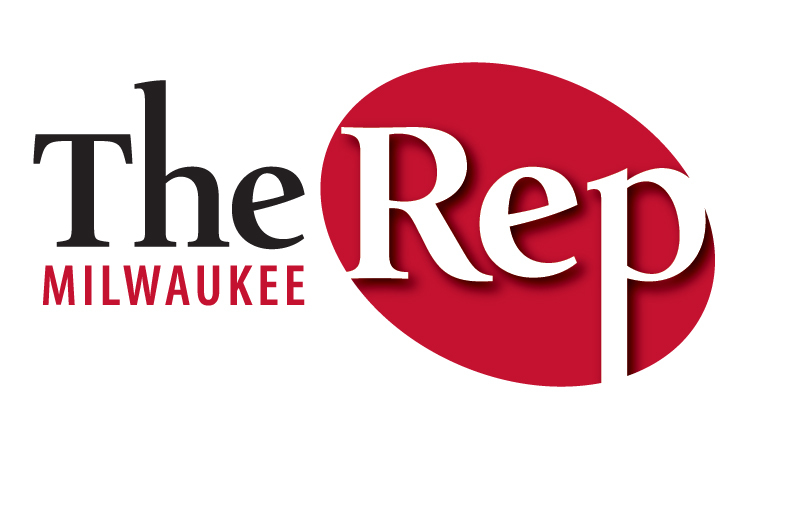 Here’s an additional link about the Rep’s season announcement in the Milwaukee Journal Sentinel. I know what some of you are thinking: Rey, did you write a play that you didn’t even tell us about? At all? To clear up any confusion, the play used to bear the title And Right Now, but I no longer felt that title served the whole vision of the play. So, yes, this is the play with Linda and Daniel in the bookstore wrestling with issues of bullying, forgiveness, and the truth in between the lines of fiction that was commissioned, developed, and read at South Coast Rep, the Lark Play Development Center‘s Playwrights Workshop, and (of course) in the Ma-Yi Writers Lab. And so with thanks to all of those places, I hope you’ll join us at Milwaukee Rep in the fall to fully realize this script.